Chat offers opportunities for real-time, unstructured conversations with users who are signed onto the course site at the same time. You may enable Chat for students to talk informally with each other if they happen to be logged on at the same time, but may not use it as a core component of their courser. Or, you may ‘meet’ with the class at specific times to hold discussions on course topics or to answer questions. You may also use Chat to set up private chat rooms for your students to ‘meet’ and discuss their group projects, without ‘attending’ their meetings. Some instructors use Chat for office hours. Under Manage in Chat, you can perform several functions, such as adding, editing and delete chat rooms. You can create more than one chat room for different purposes. To add a chat room, click on Add under Manage. To edit a chat room’s title or access settings, click on its title. Make the adjustments and click on Done. In order for chat rooms to be visible to students, you must publish them. Select the chat rooms and click on Publish. 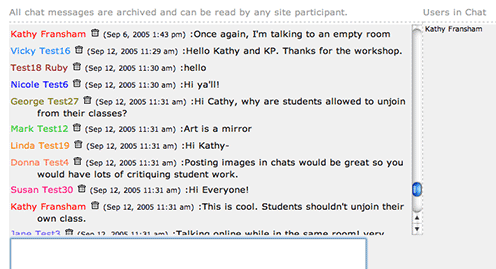 To remove a chat room from the student view, unpublish it. Check the chat room to select it and click on unpublish. You may change the order of a chat room by using the numeric drop-down menus or by drag-n-drop. Be sure to Save! The first chat room is the default one. It is always published. 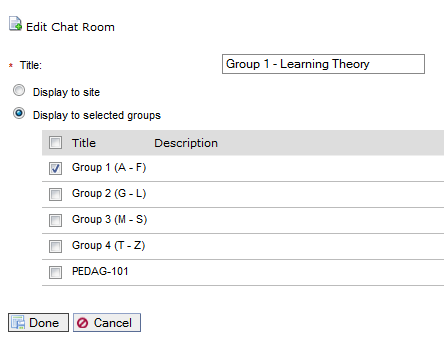 The default chat room is where students and instructors will land on when they first enter the Chat tool. Also, it is the default room’s chat messages that users see in the site’s Home Page, if you have enabled Chat in the Options of your Home Page. You can make any chat room the default by moving it to the first position (under Manage). A group forum cannot be the default chat room, as it has to be available to the whole class when they enter Chat. You can only delete a chat room if it has no messages. You may set up private chat rooms for your site. First, set up groups in your site (See Setting up Groups). Go to Chat >> Manage >> Add. Add a title for the group chat room. Select Display to selected groups, and check the group that should have access to the chat room. Note: If you don’t have the option to “Display to selected groups,” it means that you have not completed step 1, and you have not established groups in your site. On the Manage page, select the chat room and publish it. Only group members will see it. Repeat steps 2 – 6 for every private group chat. Enter the Chat tool by clicking on Chat on the left menu of your site. You will land in the ‘default’ chat room. Chat messages are saved and visible to all users (unless they are in group chat rooms). The most recent chat messages are at the bottom of the dialog. Under messages there is a box for you to type in your comments. Click Add message to post it. Click Clear to empty the box without posting your message. When you hit the Enter/Return key on your keyboard, that also posts the message. You can see who, if anyone, is in the chat room at the same time as you on under Users in Chat to the right of the messages. If there are more than one chat rooms available, you can click on its title to enter it. You can see if others are in any of the other available (published) chat rooms, as the number of users is listed below the titles. In the below screen shot, we are looking at the Office Hours chat room. We can determine the active Chat from the heading (top left) and the highlighted chat room under Chat Rooms (last column). Additionally, we can see that there are 2 users in the Office Hours chat room and who they are (Scott Lee and Vivie Sinou). When you are in a course site, you can also see who is in Chat from the small blue dot that appears next to their names in the users present box. Please note that there is a slight time lag (10 – 20 seconds) when people hop in and out of Chat. While it may appear they’re still there, but they may have just left. View Choices – These are available to all users in the main page of Chat. No Date or Time (The default is to show Date and Time). Options – Under Options, instructors can specify how many messages to display in chat rooms (show all messages, show a specific number of messages, or show messages from a specific number of days). These settings are global and apply to all chat rooms in a course site. Show All Messages is the default setting. Permissions – The default permissions of Chat can be changed by the instructor of a site. Instructors can delete their own messages, by default. Students cannot, unless instructors give them permission. There is a trash can icon next to each message for the delete function. It is best to not change the permissions. It is also advised to not delete any chat messages as you would remove the evidence permanently. If someone posts something offensive in a chat room, you can unpublish the chat room temporarily which will remove the room from the students’ view, or you can print a hard copy of the Chat text transcript prior to deleting any offensive messages. Each participant’s name shows up in a different color. However, the colors are not the same across all systems. Your name will be red when you’re logged into your own account. It will be a different color on someone else’s account. You can’t control your name color. It helps differentiate the different speakers in the dialog. Chat rooms along with their settings and options transfer to new sites with import from site. Group chat rooms also get copied. Just make sure to also select “Roster (Groups)” when running import from site.